It's time to get ready for our spectacular CLASS OLYMPICS! Saturday, April 13th. 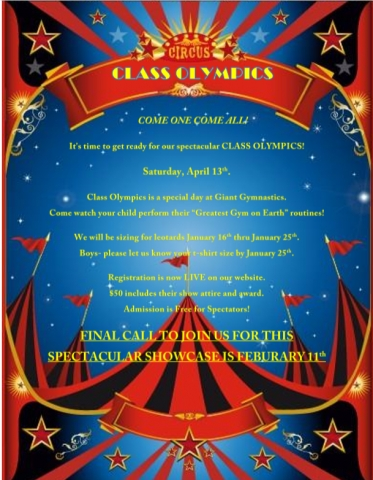 Class Olympics is a special day at Giant Gymnastics. Come watch your child perform their "Greatest Gym on Earth" routines! We will be sizing for leotards January 16th thru January 25th. Boys- please let us know your t-shirt size by January 25th. Registration is now LIVE on our website. $50 includes their show attire and award. Admission is Free for Spectators!